There are hiking dogs. Kayaking dogs. 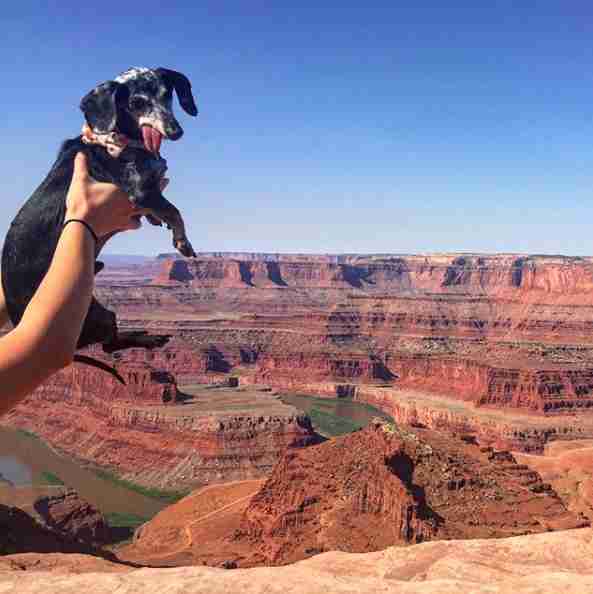 Mountain climbing dogs. And then there’s Professor Schnitzel. 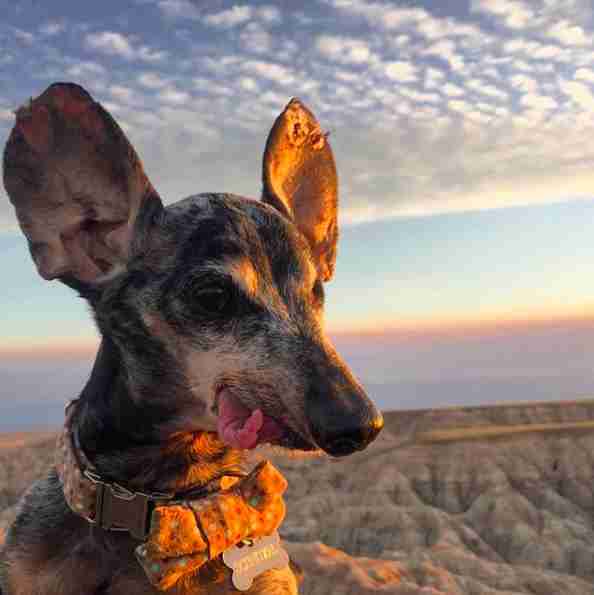 Professor Schnitzel has traveled a lot — and he has the Instagram pictures to prove it. 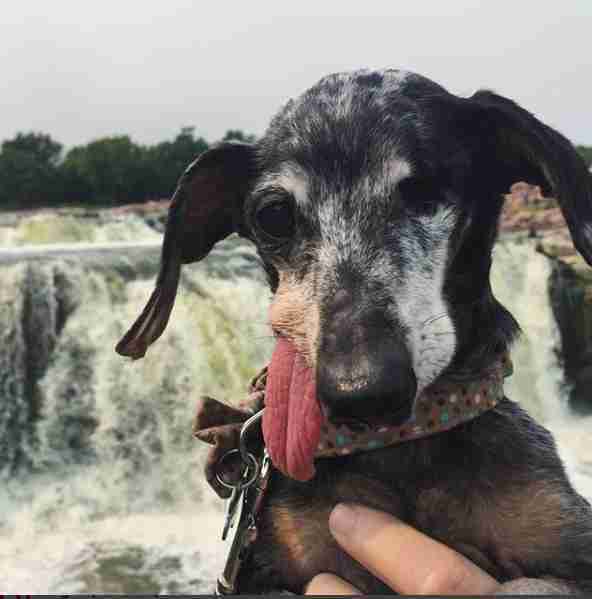 But as a 13-year-old dog with tiny legs, Professor Schnitzel doesn’t hit the trails hard or leap into lakes. 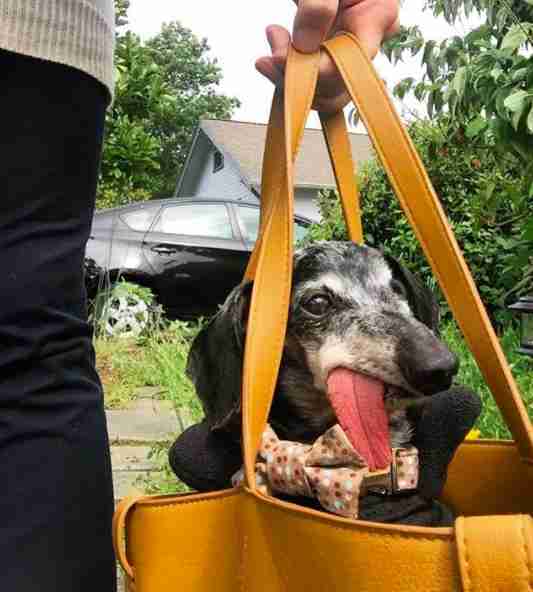 Instead, he prefers short walks, being carried around, gazing out the window from the warmth of a car and posing for photos with his tongue flopping out. Before Professor Schnitzel became Grutzmacher’s traveling companion, he was a sickly stray scampering around Washington state. A police officer picked him up and dropped him at a local shelter in Oregon. 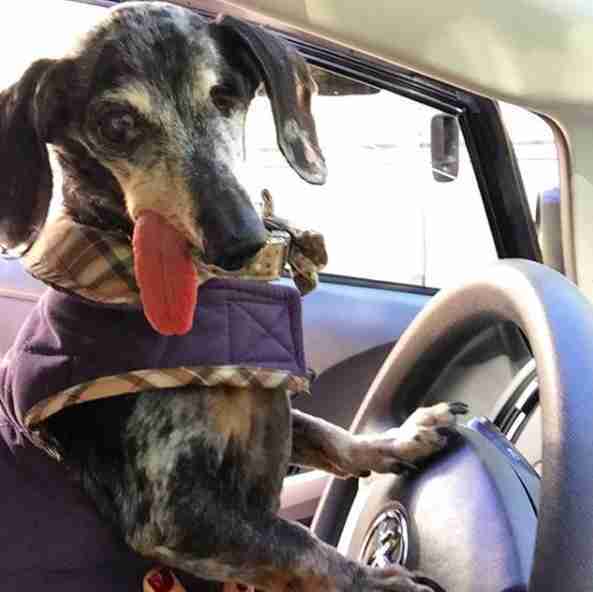 If Professor Schnitzel had stayed at the shelter, he wouldn’t have lasted long — due to his age and a myriad of medical issues, he was scheduled for euthanasia after his mandatory three-day stray hold. But dog lovers from the Pixie Project, an organization that rescues dogs from county shelters, pulled Professor Schnitzel out just in time. 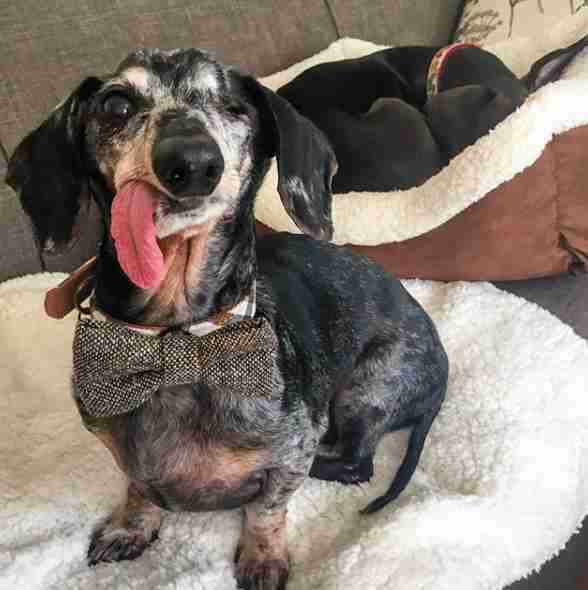 They also got Professor Schnitzel the vet care he needed — he needed an eye removed, as well as treatment for skin lesions, a hernia and other health issues. 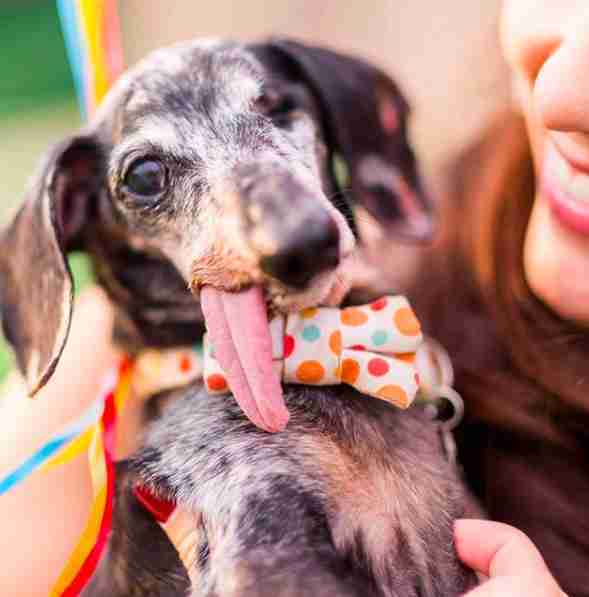 When he got better, they posted Professor Schnitzel’s photo on their adoption page — and that’s how his mom found him. 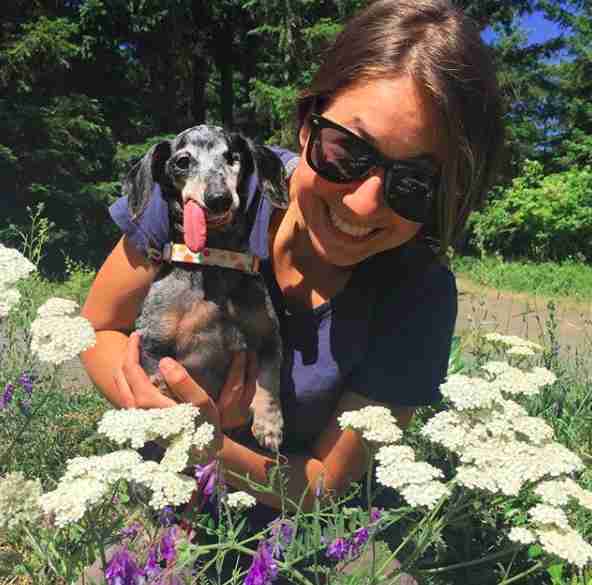 Six months ago, Grutzmacher had adopted another dog from the Pixie Project — a 6-year-old pinscher-greyhound mix named Beverly. Grutzmacher also had a border collie mix named Molly. 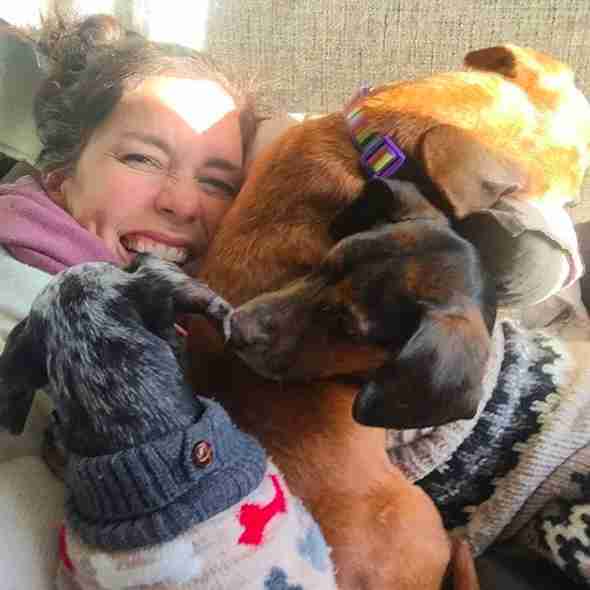 The last thing she’d intended on doing was to adopt another dog. But then she saw Professor Schnitzel’s profile. Professor Schnitzel’s most distinctive trait is obviously his tongue, which spends more time outside of his mouth than in. He’s also got teensy little legs and a tiny body. 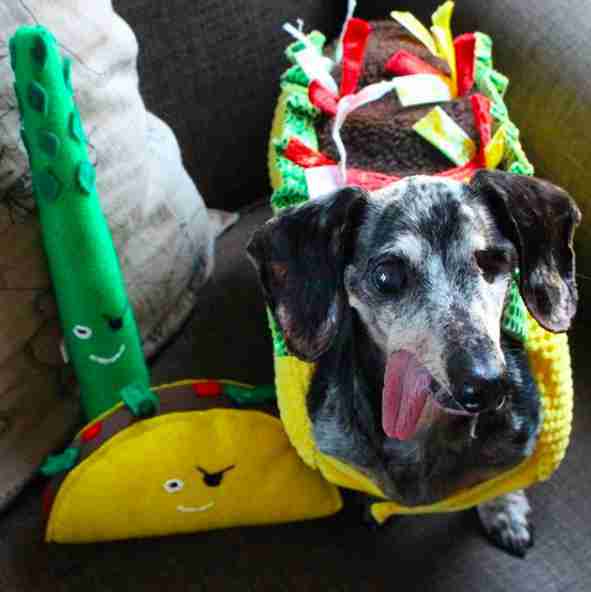 “He’s like the size of a burrito,” Grutzmacher said. 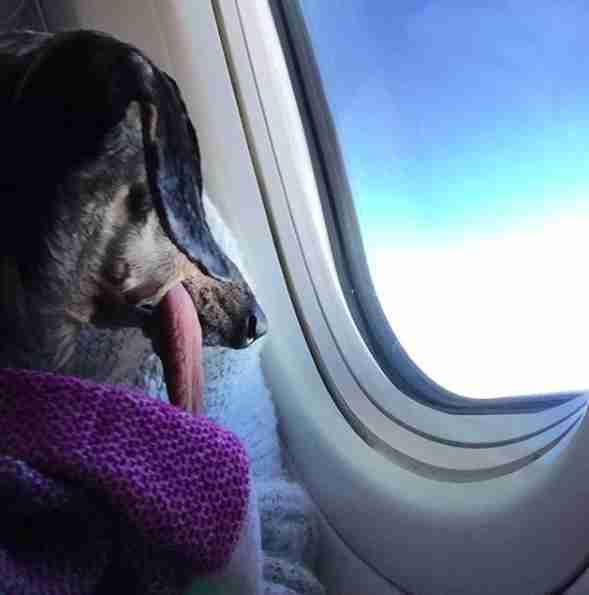 Being part of Grutzmacher’s family has come with plenty of perks — one is that Professor Schnitzel gets to travel a lot. 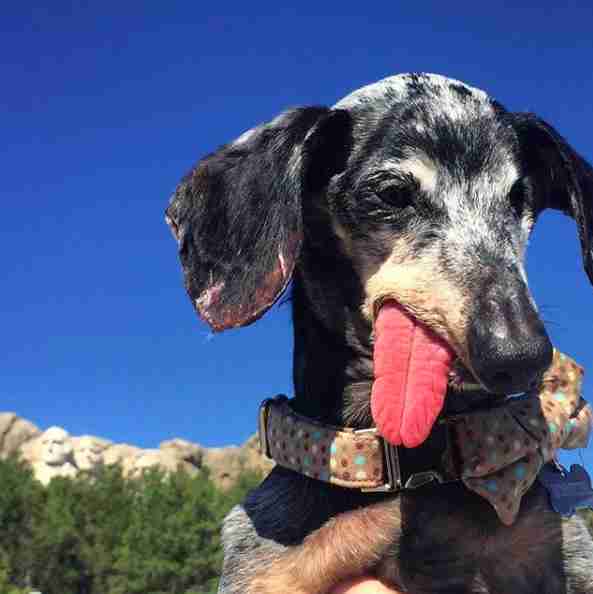 On these cross-country trips, Professor Schnitzel has gotten to visit major cities, national parks and monuments. Grutzmacher thinks that his favorite destination was the Badlands National Park in South Dakota. So far, Professor Schnitzel has traveled to 18 states, and he’ll visit Florida over the Christmas holiday. “He’s going to love it, because it’s going to be the warmest he’s ever been in his entire life, which is probably his happy place,” Grutzmacher said. Professor Schnitzel has also gotten to fly. “He was watching out the window of the airplane, and he looked genuinely curious about what was going on out there,” Grutzmacher said. 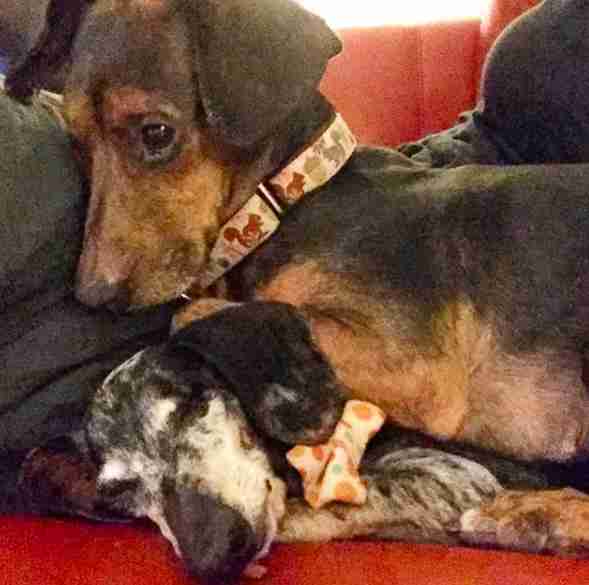 When Professor Schnitzel isn’t traveling, he enjoys chilling out with his new dog siblings, Beverly and Molly, as well as the various foster dogs whom Grutzmacher cares for. “So they all get along great, and they keep each other warm, but he definitely is smaller than they realize — and he ends up in strange situations because of that,” she added. While Professor Schnitzel is in good health at the moment, Grutzmacher recognizes that he is older. But she is determined to make his last years — or months — as enjoyable as possible. “We adore him,” she said. 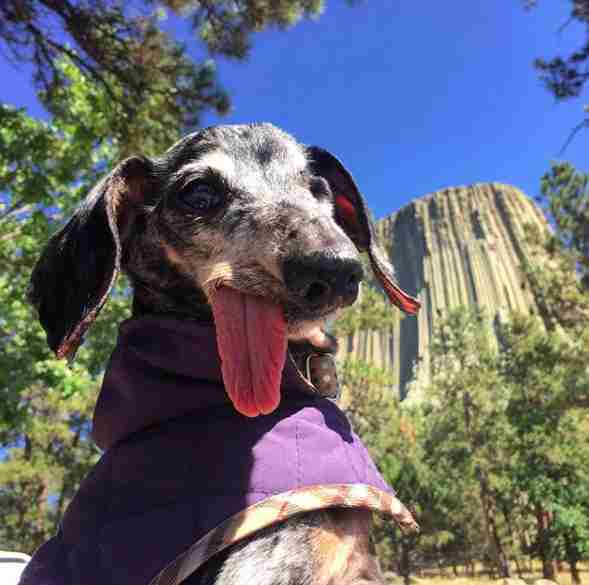 To see more photos of Professor Schnitzel’s tongue flopping around as he travels the country with his mom, you can follow his Instagram page. Looking to adopt your own Professor Schnitzel? Then meet Dodo Adoptbot, an interactive guide for new pet parents. Get started on Facebook Messenger or text HOME to 38349.